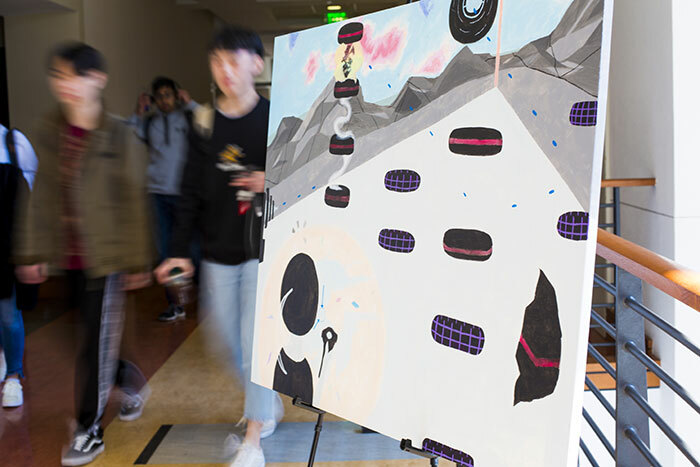 A painting by Georgia Tech student Bianca Guerrero portrays a virtual reality game used to measure players’ perception of time as well as eye movement. The art is based on research by Georgia Tech psychologist Malia Crane. 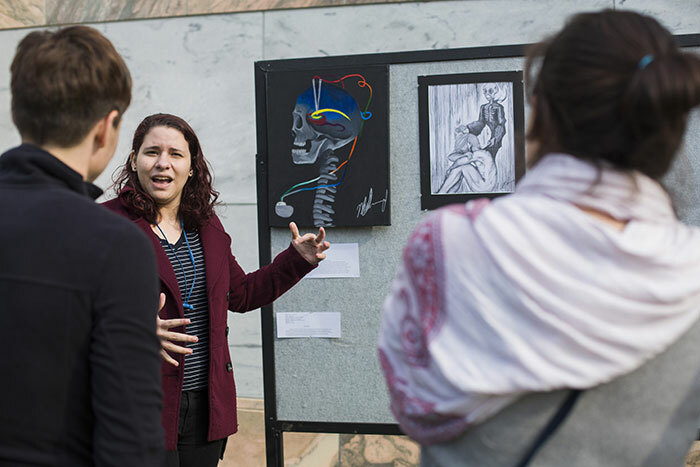 Emory senior Pamela Romero, S.A.W. 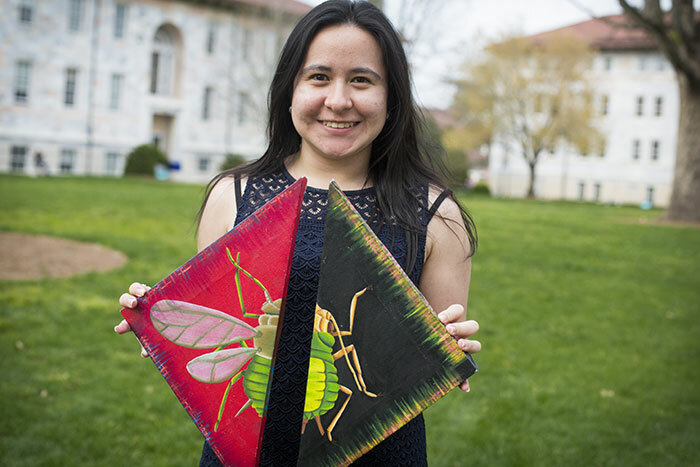 president, teamed with Emory biologist Nicole Gerardo to create “In Response.” The work portrays how aphids can develop wings in response to environmental changes. 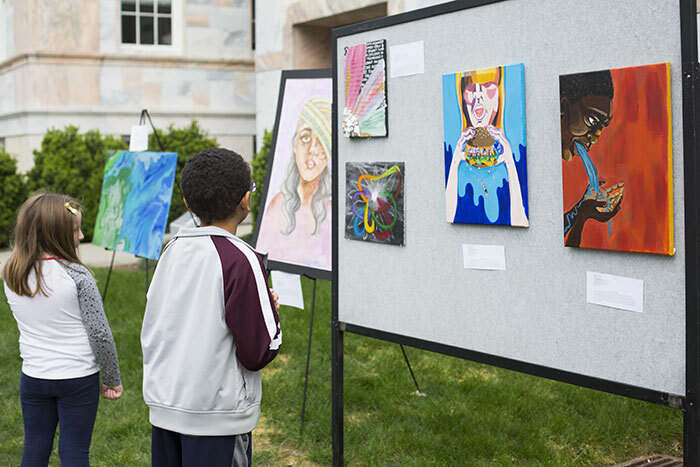 Young visitors to the Emory campus peruse some of the S.A.W. art on the Quad, including pieces done by Emily Isaac, a first-year Emory student majoring in environmental sciences and theater, who portrayed work by Georgia Tech’s agricultural program. Faculty mentor Nicole Gerardo (center) with students on S.A.W. 's executive team, from left: Veronica Paltaratskaya, Pamela Romero, Alex Nazzari and Iris Liu. Not pictured are Alia Jiang, Anne Pizzini, Deborah Seong, John Wang, Olivia Cox and Siyan Li. 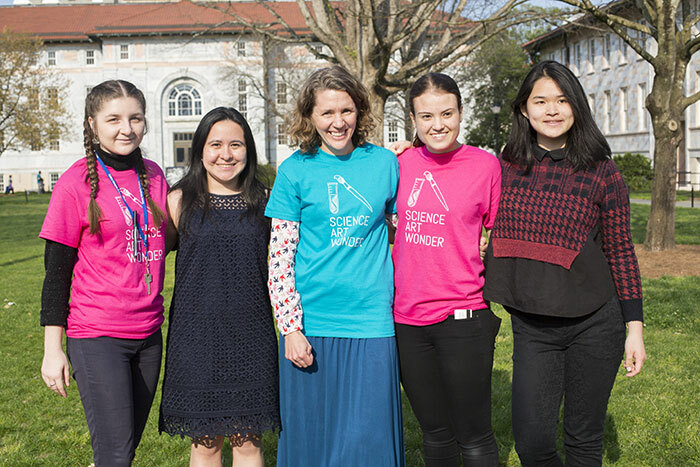 Emory senior Maureen Ascona, a neuroscience and behavioral biology major, shown above, teamed with Helen Mayberg, a professor at Emory School of Medicine who uses deep-brain stimulation to help patients with treatment-resistant depression. 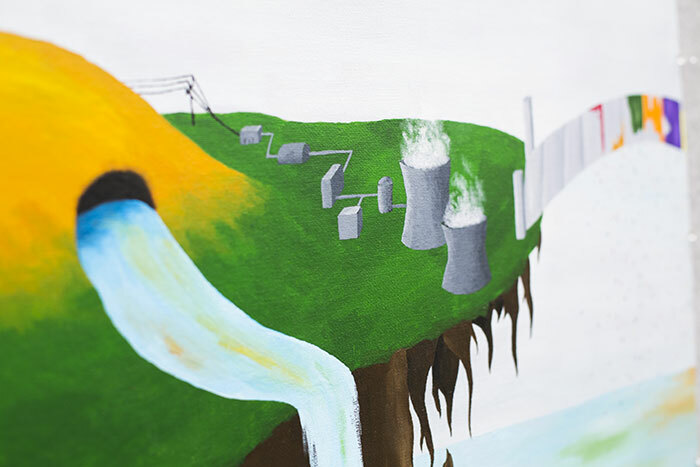 A painting by Georgia Tech student Kate Bernart, “Connecting the Cycle,” portrays Austin Ladshaw’s research at Georgia Tech’s School of Environmental Engineering on the nuclear fuel cycle and ways to prevent excessive accumulations of radioactive waste. A piece by Alice Yang, a first-year Emory student, who teamed with researchers of human genetics in the Emory 3q29 Project. 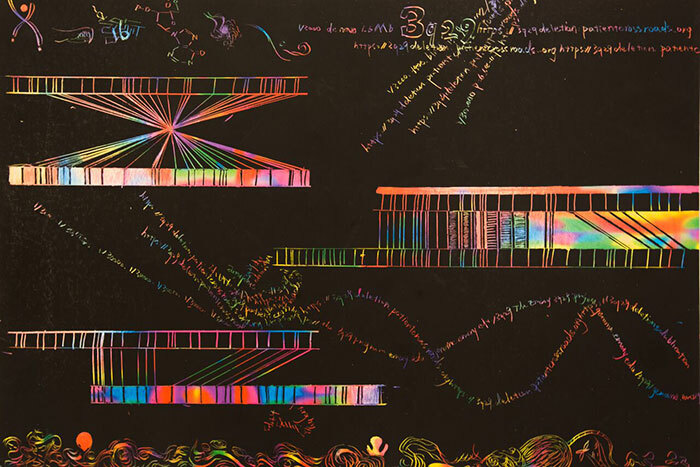 Yang used the medium of scratch-off paper to portray the nanomapping of fluorescent-labeled alleles, variant forms of a given gene.